Ozonolysis is reaction where the double bonds of alkenes are cleaved with ozone (O3). Alkanes form compounds in which the multiple carbon-carbon bonds have been replaced by a carbonyl group. 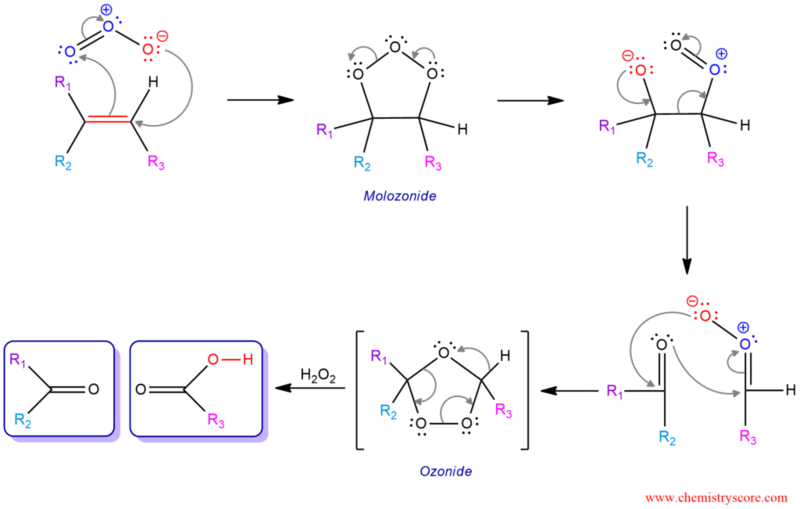 In oxidative workup, a carboxylic acid is produced. Ozonolysis is the specific reaction in which cleavage occurs and π and σ bond. Although reductive workup is the most common, there is another type of ozonolysis and this is oxidative workup. Instead of using DMS or Zn, if we use the oxidant hydrogen peroxide (H2O2), any aldehydes that form will be oxidized to give carboxylic acids. An alternative to using ozone for oxidative workup is to use the reagent KMnO4, especially in the presence of a hot acid; this will lead to the same result. The mechanism of this reaction is the same as for the reductive workup. The only difference is the reagent which is added to the last step. It is believed that the first step of this mechanism involves initial syn-addition of ozone. The π electrons act as the nucleophile, attacking the ozone at the electrophilic terminal oxygen. A second carbon-oxygen is formed by the nucleophilic oxygen attacking the other end of the carbon-carbon double bond. This is followed by rearrangement of the extremely unstable molozonide addition product. The formed ozonide is decomposed into the ketone and the carboxylic acid by hydrogen peroxide.